Also, The Wild Dove. Nikolaus Harnoncourt, Royal Concertgebouw Orchestra. Warner Classics 3984 21278-2. 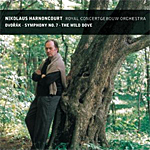 In the late 1990s, conductor Nikolaus Harnoncourt turned his attention to the Dvorak symphonies and began recording them live for Teldec with the Royal Concertgebouw Orchestra. Warner Classics has now reissued them on the Warner label, and for the Dvorak fan, they are worth looking into. Harnoncourt recorded the Dvorak Seventh Symphony we have here in 1998, before a live audience. Well, the audience is neither here nor there as we never hear a peep from them, perhaps because the orchestra is miked more closely than in many competing live performances. The result is good, well-focused sound that tends to reinforce Harnoncourt's meticulous reading of the score. However, be aware that the conductor often seems more concerned about following the letter of the music than about evoking the spirit of the work. This appeared most conspicuously to me when comparing his rendering of the first two movements with those of Colin Davis on Philips, both men conducting the same orchestra years apart. Fortunately, by the final movement, especially, the differences become more slight. Maybe it took Harnoncourt a while to get into the proper swing of things in Dvorak, rhythms and nuances that Davis seems as though he took in his stride from the very beginning. The real surprise for me, though, was discovering Harnoncourt's interpretation of the tone poem "The Wild Dove" (alternatively translated as "The Wood Dove"). Like Dvorak's other tone poems, the composer based this one on a fairly lurid folk tale, "The Wild Dove," concerning a young woman who has just poisoned and buried her husband, then remarried. The cooing of a wild dove above her late husband's grave eventually drives her mad, and she commits suicide. Sweet. Harnoncourt captures the vitality, the pathos, and the irony of the story perfectly, with greater flexibility than he imparts to the symphony. The audio engineers manage to keep the live symphonic recording and the studio tone poem sounding much alike, but I had a mild preference for the tone poem, which sounded to me a touch clearer, more transparent. The last page of the CD booklet lists the two-disc compilation of Dvorak's four main tone poems with Harnoncourt (which originally came coupled with various of the symphonies on separate discs), and that disc compilation (from Warner Classics) is a must-have set.